After due diligence it looked like the Polycom CX300 USB phone was a great replacement for the desktop phone. Another alternative was to use a headset, but many people are loathe to move from a handset to a headset. I established my enterprise OCS account, got logged in using Office Communicator Mac 2011 version 13.0.0 (100825) [Edit: no difference with version 13.1.0 (101123)]. I was able to successfully send and receive a call from my MacBook Pro using the built-in microphone and speakers. But at work, I want to get calls on my trusty (if aging) Mac Pro. 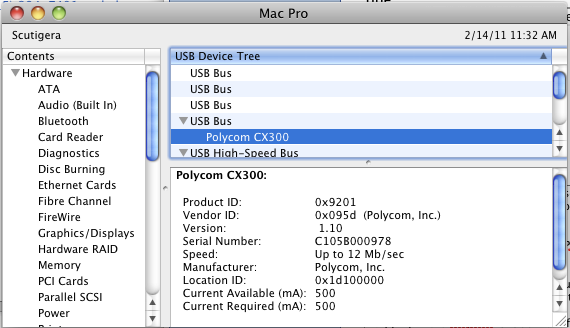 Plugging in the Polycom CX300 went fine, and OS X 10.6.6 recognized it. But the display on the front of the Polycom said "Sign in to Office Communicator". Uh, I'm already signed in to Office Communicator. 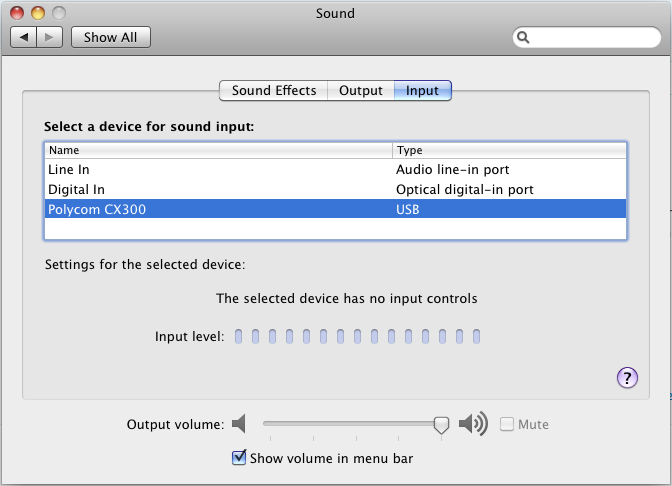 Open your Sound control panel from System Preferences. Select Polycom CX300 under the Input tab. After a few seconds, the display on the front of the Polycom will change to a phone icon and you will be able to receive calls on the phone. Don't close the control panel! If you close the control panel, the phone will go back to "Sign in to Office Communicator". You normally leave a control panel open on your computer all the time anyway, don't you? Note that you won't be able to use the keypad on the phone to call anyone. You can do it from the Communicator software but not from the phone. Why would anyone want to make a phone call from their phone, anyway? Conclusion: Microsoft Communicator 2011 for Mac has no real support for USB phones. Having to open your Sound control panel and leave it open is not an acceptable workaround. You can tell how serious Microsoft is about the Mac client by the fact that Communicator doesn't even have its own community support forum, but is relegated to Other Microsoft Products for Mac.